Welcome to Garden Bloggers' Bloom Day for January 2014. Here in my USDA Hardiness Zone 6a garden in central Indiana, I had to go inside to find blooms in January. Fortunately, it wasn't that difficult to find a few indoor blooms. I followed my nose to find the Lily of the Valley, which I purchased as pre-cooled pips and planted about five weeks ago. I've been enjoying the blooms for quite awhile now. They've added to my indoor garden and later this spring, I'll plant them outside, where someday they'll bloom for an outdoor bloom day in May. 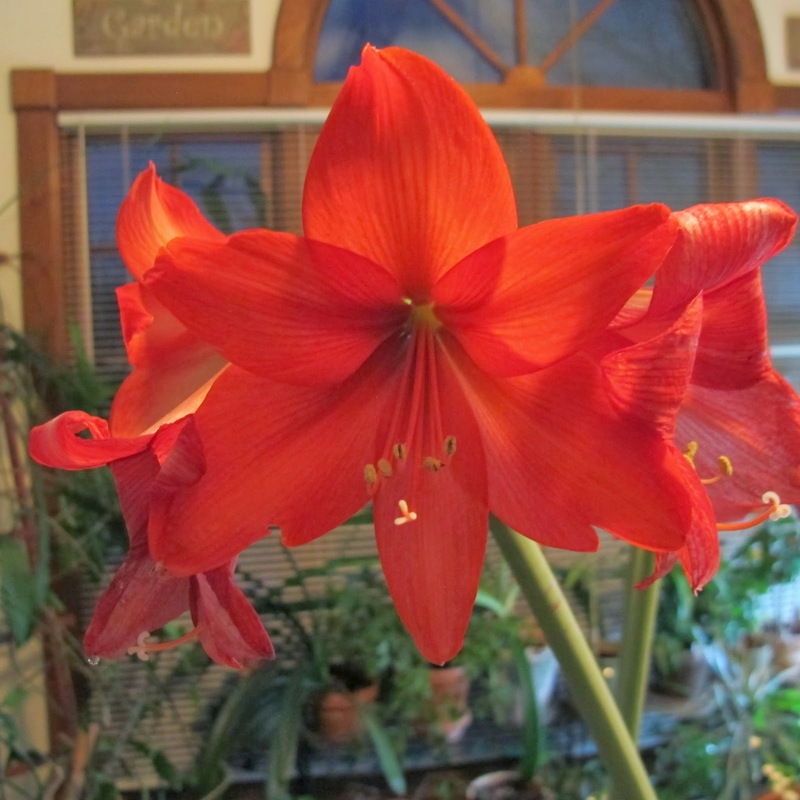 I've still got a few Amaryllis in bloom, though there are far fewer now than a week ago. I enjoyed having these blooms last week when I was trapped inside by a raging snowstorm that dumped nearly a foot of snow on my garden and dropped the temperatures to sub zero for a day or two. Now a week later, most of the snow has melted, but there are still no signs of blooms outdoors, unlike last year when I counted four blooms outside. What else is blooming here at May Dreams Gardens? 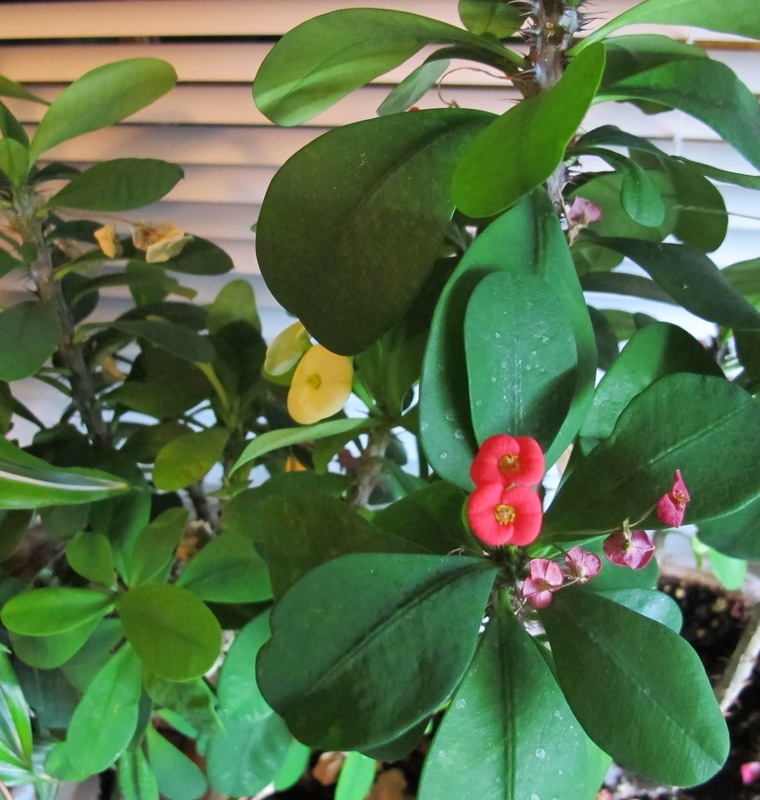 In the sun room, the Kalanchoe is still blooming along with these two Crown of Thorns plants. I can always count on Crown of Thorns to have a bloom or two, regardless of what else is going on in my garden or sun room. And that's what I've got to show for this bloom day, my 84th time to post on the 15th of the month about the blooms in my garden. There are several other garden bloggers who have posted for Garden Bloggers' Bloom Day from the beginning who now also have this seven year record of their garden. How long have you been posting for bloom day? Whether this is your first time or your 84th time, we'd love to read about what is blooming in your garden today. It's easy to join in. Just post on your blog about what is blooming in your garden on the 15th of the month and leave a comment to tell us what you have waiting for us to see so we can pay you a virtual visit. Then put your name and the url to your post on the Mr. Linky widget below to make it easy to find you. Beautiful indoor blooms. I would love to see Lily of the Valley one day. It's not something we see here. Carol-your indoor blooms are lovely. I have some berries and dried seed heads in the garden. 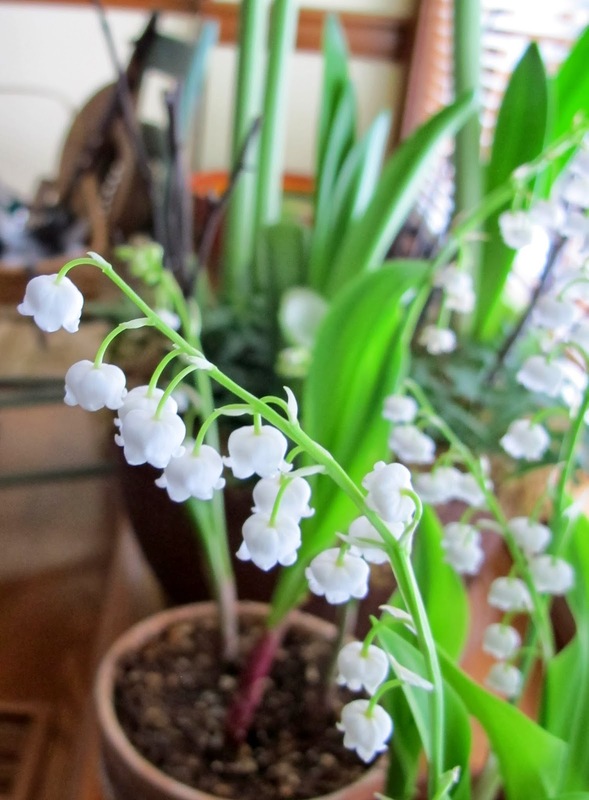 At this time of year with cold temperatures indoor gardening is the way to go for blooms and I will have to remember the Lily of the Valley for next year. This is my fourth year with Bloom Day and I look forward to it every month. Thank you for hosting! I haven't returned home to our garden since New Year and start of work in the big city. So i just posted only one and not many blooms although we have a lot because we are in the tropics. The problem is i get bored posting the same kind of flowers, this one is different, so i posted it as my bloom, haha! That Euphorbia millii you got there is always flowering profusely with us, and we have 5 different colors of them. The smell from the lily of the valley must be scentactional! Even though that plant is renowned for being quite weedy in my mums garden I find it hard to establish in my own garden here in Scotland. My records from GBBD over the last 3 years have been a great resource too at leavesnbloom. How wonderful to have the scent of Lily of the Valley in January! As my blog is now over a year old, I can look back too. It will be so useful to have a few more years of history. It must really make you conscious of the vagaries of the seasons from year to year. Congratulations on your seven years Carol and thanks for hosting 84 times! You have lovely indoor blooms with beautiful perfume from your Lily of the Valley - wonderful. I must try more bulbs for indoors next winter to keep me happy when I can't get out to the garden, with us it is usually because of torrential rain not snow. Thanks for hosting once more. We've had wild storms here in the UK, but unlike you snow has yet to hit VP Gardens. It's been quite mild so far (crosses fingers), so I have a surprise return of some outdoor cyclamen to report for this month's Blooms Day! I really love the lily of the valley and will have to seek those for indoor growing next year...Happy GBBD Carol and thanks for hosting!! I love your idea of growing lily-in-the-valley in pots to bloom in winter. I shall try that next year. Thank you for hosting Garden Bloggers' Bloom Day. It is such fun to join in and see what other enthusiasts have in bloom. Happy Bloom Day Carol! I thought I would have to stretch the rules and be creative for this month, but I did have one bloom in the garden and it was being worked over by honeybees. It was a nice surprise. We are lucky to have indoor blooms today. I love your pips. I am going to try to remember to do that next year. Happy GBBD. Happy GBBD~I have one bloom in the garden, which is very good, since I don't do houseplants! I am not so much concerned with bloom as the color green in the garden this time of the year. Evergreen plants in a midwestern winter garden are good. Happy 84th GBBD Carol! Your indoor blooms are wonderful! I inherited a nice patch of lily of the valley with my garden. It's right by the front door in a place where you don't really see it but each year in May, that heavenly fragrance greets me when I come home. Even after our freeze, we have a few winter bloomers outside. The lilies of the valley are wonderful! I'll have to try that when we come back to the U.S. I've been contributing Bloom Day posts since July 2011. Those lily of the valley are so sweet! I need something like this to perk me up during this long winter. Thanks for hosting this once again, Carol. I've posted on every GBBD since I started blogging, which will soon be 6 years. I hate to break the cycle, so I'll probably post something later today, though I'm going to have to really hunt--not even my amaryllis is blooming yet! Those lily of the valley must perfume your house. What a wonderful scent at this season! Happy Bloom Day Carol and congratulations on establishing such a fun and useful meme! With the mild winter we are having here in Central California I do have several blooms this month. You inspired me to order some Lily of the Valley. Such beautiful flowers. Remind me of my Grandmother. Thank you for hosting. Love the L o V. Everybody deserves something in bloom in the worst climate in January -- on a window sill. My first Bloom Day was January 2008. Then as now I had Camellias. Love the Lily of the valley! This is my 2nd January post. I began my garden blog at the end of 2012 and now have 12 months of prior Bloom Day posts for reference. Your meme has become one of the best tools I have to track the progress of my garden. Thank you for creating and maintaining the Bloom Day record! Hi your lily of valley blooms are awesome hope to get it one day for my garden too. p.s. Do visit my blog too. I should have thought to peek inside for bloomday too! I could have shared some lovely protea blooms. Ah well. Glad the snow and cold has departed for you and hope spring will be early this year! Oh, love that Lily of the Valley - what a wonderful idea! I will have to think of that for next year. I have seen a variegated leaved Lily of the Valley that interested me. A sun room would also be nice - especially if there were sun! Indoor blooms are challenging to find in the tree category -- I was lucky to have found some on my regular route since they are not in my yard this month. Thank you for hosting bloom day! This will be my first ever January post, I'm only pleased to have blooms to share. Thanks for hosting and well done on reaching 7 years! As always, thanks for hosting Bloom Day, if I counted right, this is my 15th time joining you! Bloom Day is inspirational in more ways than just one. Many thanks and enjoy the sweet scent of May Lily of the Valley. Happy bloom day, Carol! I joined you for the first time in April of 2012 and it has proved to be a useful reference ever since. I have nothing, I can't even stretch it, but I'm looking forward to seeing everyone else's blooms! Happy Garden Blogger's Bloom Day! I don't have indoor or outdoor blooms but I have the promise of ones to come. Your Lily of the Valley is gorgeous! About time I linked in again. I think we appreciate winter flowers even more when they close at hand. Thanks for keeping the meme going. I've nothing to show myself this month, but am enjoying the blooms of others. Happy Bloom Day to all! Happy Bloom Day Carol! Growing Lily of the Valley indoors is a fantastic idea! I can only imagine how wonderful they smell. I may have 84 Bloom Day posts, but some of them were on Maui. I do have 6 and 1/2 years of posts from NC. And of course I have the ever faithful Snowdrops for the meager Bloom Day of January 2014. I hadn't thought of forcing Lily of the Valley, that's a brilliant idea. I knew I'd regret not forcing any bulbs this year! I need to try those new colors on the Crown of Thorns -- my neighbors' gardens are filled with them, in bloom now too. Happy Bloom Day, Carol! For this January, I cheated a bit and went and looked for flowers in a different garden, even though I have some in my own! But who wants to see my sad, frost bitten flowers, when the aloes are blooming at the Huntington? Thanks for hosting for 7 (!) years! Thanks so much for hosting again, Carol! It seems as though it is as cold where you are as it is hot here. You need a little spring, and we need a lot of winter. Your Amaryllis and Lily of the Valley are lovely! The fragrance from the Lily of the Valley must be heavenly! We are having abnormally warm days and spring is on the way. What we desperately need is rain! It's been a very dry year. Thank you for hosting GBBD for so many years! Wow Carol - 84x GBBD posts that's an impressive garden record. I joined you part way through your first year. Although over the last few years my posts haven't been every month I do still enjoy taking part. Congratulations on keeping this going/hosting for everyone to enjoy and meet up. I've always wished Lily of the valley was happy in my garden. Can't think why I haven't thought of growing it indoors. My month's bloom is also fragrant - the winter honeysuckle is very early this year. Happy 84th! It looks like I'm going on about 6 and a half years of participating on and off... It doesn't seem like that much time has gone by! Thank you for starting GBBD and for keeping it going! Hi Carol - my first time at bloom day, took the pictures a couple of days earlier but all of them are still blooming - especially the red cyclamen in the greenhouse. Thanks for providing the forum to share the wonders of flowers! Love that Lily of the Valley - that's not something you see very often in others' indoor gardens. Pam and I went nursery shopping on Friday and bought a few house plants and tillandsias and I had a crown of thorns in my hand - wish I'd bought it - you're right - they do bloom most of the time. Happy Bloom day - sadly, no post from me this month. Next month, I promise! Stay warm. Nice amaryllis. Thanks for hosting! I love your Amaryllis bloom! And the lily of the valley! I can't wait for spring to smell these beauties! This is only my fourth time sharing my garden on your site and I would like to thank you for hosting!